"...The hosts are gracious and kind, we enjoyed listening to Suzanne give us some history of the house and the town. Each morning at breakfast she told everyone what was going in and around South Haven. This really helped us plan our day. We will definitely stay at the Carriage House again." The Ambassador Resort in South Haven, now called Carriage House at the Harbor, was built in 1886 by J. F. Crowley for Henry and Ellen Avery as their primary residence. In 1920, it was sold to Lam Kim and became the Lam Wah Inn. There is a framed post card at the Carriage House advertising the Lam Wah Inn that says “running water in every room”. I wonder how Mr. Kim would feel about our Jacuzzi’s? Philip Kauffman purchased it in 1947 and renamed it the Ambassador Hotel. It was a popular summer hotel into the 1960’s when it became a rooming house. After a stint as an adult foster care home it was renovated in 1995 by Joyce and Jay Yelton and renamed the Carriage House at the Harbor. The Yelton’s sold the house in 2001 to Linda and Jim Mitte. It changed hands again in 2005 to Victoria and Scott Reinert. The current owners are Suzanne Schloss and David Zeff. The area was first founded in 1787 by Ottawa, Miami and Pottawattamie Native American tribes who named the land, "Ni-Ko-Nong," or "beautiful sunsets." In 1833, pioneer J.R. Monroe founded South Haven when the U.S. government granted him a land patent for 65 acres along the shore of Lake Michigan. South Haven remained just a small settlement for the next 20 years until a few early pioneers established permanent residence. In 1858 the population had grown to two hundred. The community continued to expand during the next several years even though it was virtually isolated except for lake travel. The only access to the cities and villages to the east was by stagecoach over rough roads and through untouched wilderness. Between South Haven and Kalamazoo were great stands of virgin pines and hardwood. 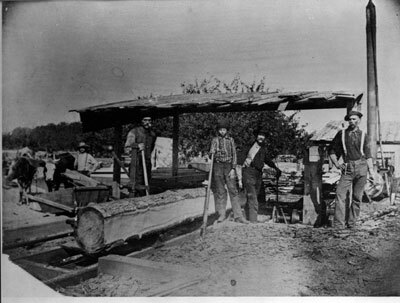 The early sawmills brought timber down the river by log floats, but much of the forest was inaccessible until the railroad was brought to South Haven in 1871. By the mid 1870’s, South Haven had grown to 2000 people and had a school, hotels, homes, over 25 stores, a bank and several churches. The population today is 5000 year round residents with 20,000 tourists in the summer. South Haven was incorporated as a village in 1869 and as a city in 1902. The area exploded during the next forty years. The lumber industry cleared much of the land, shipping the lumber across the lake to Chicago and Milwaukee via steamboats and schooners. One year in the early 1870’s the mills shipped over 12,000,000 feet of lumber, 1,000 cords of tan bark, 15,000 cords of wood and 40,000 railroad ties. The tannery shipped out 120,000 pounds of leather, while the fisheries caught over 515,000 pounds, with well over half of that shipped to the cities by boat and railroad. Throughout the 1860's, as South Haven grew as a port, several attempts were made to increase and work the width of the channel. The Black River served as an important means for the settlers to transport lumber products to the cities along the lakes. By 1867, the width of the channel was such to allow almost any vessel through. Soon, it became evident that a pier head beacon at the end of the pier, along with a keepers dwelling, should be developed. In 1868, the Lighthouse Board requested money for construction of the pier head beacon on the chosen site. In 1872, the original South Haven light shone for the first time. A thirty-foot tall wooden structure; the pier head, featured a 75-foot walkway bridging from the shoreline to the tower to allow the keeper to walk to safety above the wave line during storms when waves crashed above the pier. The simple wooden structure consisted of a storage room on the first level with an octagonal cast iron lantern above it. The storage room played dual duty of supply room and shelter to the keeper working on the light. Throughout the years the pier endured several extensions. In 1903 the wooden tower was replaced with a prefabricated steel tower. It was painted a glimmering white and the new Fifth Order Fresnel lens was placed in the lantern. At some point, the wooden elevated walkway was replaced with an iron walkway, and the tower was painted red. In 1940, after 68 years of individual citizens serving as lightkeeper, the Coast Guard took over the duty and does to this day. Peach, apple, and blueberry growers began taking advantage of the cleared land, and a booming fruit industry ignited in the South Haven area. 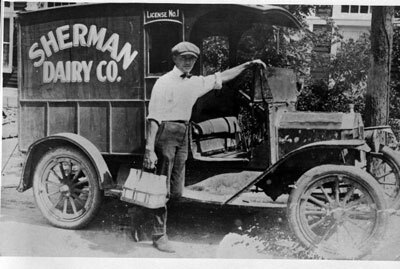 This influenced other industries as well, bringing new factories and business such as canning factories and cider mills. 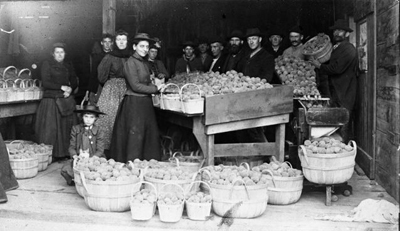 In the early 1870’s, the fruit growers shipped apples by the barrel (over 3,500 barrels) and nearly 30,000 packages of peaches in one year. Today the mills, commercial shipping and fishing industries are gone, but the fruit industry remains. The Red Haven Peach was developed by Stanley Johnston, and is the leading peach grown all over the world. The Stanley Johnson Park is located across the street from the Carriage House. South Haven has also become know as the Blueberry Capital of the United States, with our growers’ berries reaching all the domestic and foreign markets. By 1900 South Haven had survived two disastrous fires that had nearly destroyed the town. A water supply system was built, a fire department was organized and a life-saving station was established. The late 1800's saw the ship building industry flourish here to accommodate the resort trade as well as the freight business. The early 1900’s brought manufacturing to the city, such as Cable-Nelson Piano Company, a Basket Factory, Fruit Canners and a wood working plant for year round employment for South Haven. 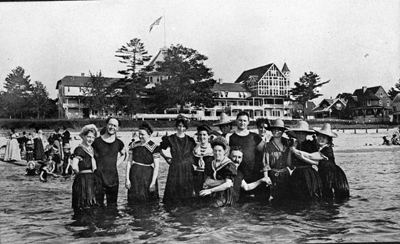 The Jewish resort era in South Haven extended from the late 1880’s until the 1960’s. The resort industry grew from simple farm resorts and boarding houses to large full-service operations that compared favorably to any resort in the nation. They provided kosher and non-kosher meals, nationally known entertainment, and an atmosphere rarely found in a small mid western town. South Haven has often been referred to as the “Catskills of the Midwest”. In 1902 South Haven had over 215 resorts, hotels and rooming houses. 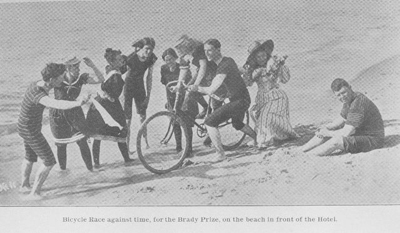 South Haven became a popular spot for tourists, attracted by theaters, a casino, an opera house, and an amusement park. There were six livery stables with thirteen draymen for hire to transport the tourists from the large steamships from Chicago to their hotels. There were also six blacksmiths to care for the horses. By the 1920's and 1930's, an auto camp replaced the amusement park, and the age of the automobile ushered in an age of prosperity for the resort town. 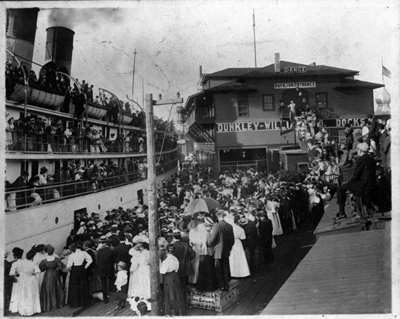 The automobile was beginning to make travel easier for vacationers, and the boat traffic began to dwindle. The Depression of the 30’s contributed to the demise of the big resort trade. By the 1960’s, there were only forty-five resorts and hotels available in South Haven. Today there are only a few inns and hotels available and about a dozen bed and breakfast accommodations. By 1960 all of the liveries and draymen were gone, replaced by auto dealers, service stations and convenience stores. In 1969, the first Blueberry Festival was held, a celebration and reflection of the great progress the town of South Haven has made in its remarkable history. An ordinance was passed that on or after May 2, 1870, all saloons where liquors are sold or given away must be closed on the first day of the week, commonly called Sunday, and between the hours of 10:00 p.m. and 5:00 a.m. for all other days of the week. No person shall enter or remain in said places during those hours. Mrs. Helen Lee was allowed $6.50 only on her claim of $12.50 for damages to a buggy and loss of goods as her horse was hitched illegally to a light pole. An ordinance was adopted requiring all cyclists to dismount when approaching a pedestrian. An ordinance was adopted as follows: It shall not be lawful for any person to open or keep open for the purpose of performing any kind of tonsorial work in any shop, room or place known as a Barbershop on Sunday. Some of those tramps sleeping along the river’s edge are liable to get a taste of the other end of one of Captain Donahue’s crutches, unless they stay away from his lighthouse walk and railing. An ordinance relative to bathing was adopted stating that any person or persons, or the purpose of bathing or, otherwise, who shall in daytime or during twilight expose his or her person except head and arms and legs below the knee shall be subject to a fine of not less than 3.00 and costs. The lamplighter was instructed to use his judgment in lighting the street lights when there is a moon. A bill against the village for $4.00 for burying a dead horse on the lakeshore was presented to the council. The Dunkley Canning factory at South haven is still in need of five to one hundred women or girls to pare peaches, pears, and etc. Good wages can be made from $1.25 to $1.50 per day…the paring rooms are cool and pleasant. . All that is needed is a paring knife and apron. The factory is located about twenty rods east of the M.C. Depot. They will have an unusually long season, as there are 29,000 bushels yet to pick.